Introducing our new, small gas insert, the 31 DVI. This insert represents a new direction in gas heating that offers you a top-quality gas fireplace insert at an affordable price. The 31 DVI is all about basics: a big, beautiful, brightly glowing fire and a simplified operating system, yet offering the same glass viewing area as the top selling Fireplace Xtrordinair Model 32 DVS GreenSmart™ gas insert. The 31 DVI features the basic GreenSmart system with the Dancing-Fyre™ split-flow, burner and IPI electronic ignition that allows you a great fire display and a “green” money saving solution to home heating. 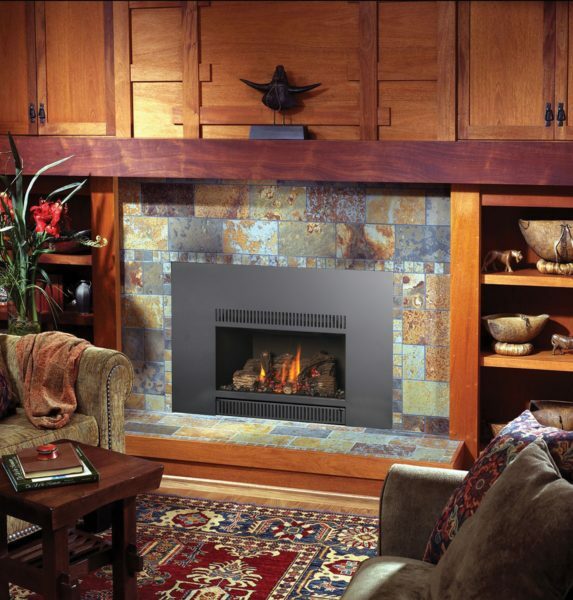 Dancing-Fyre™ Burner offers the choice of a traditional logset with realistic logs, glowing red embers and wood-like fire or the Stone kit with tumbled glass floor in your choice of reflective platinum, bronze or cobalt blue colors. The 31 DVI is designed to heat up to 1,500 sq. ft. and is ideal for small to mid-sized homes or for zone heating a moderate living space.